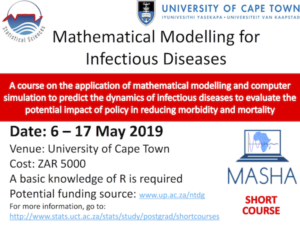 The Department of Statistical Sciences will be hosting a two week short course on the Mathematical Modelling of Infectious Diseases. With increases in computing power and renewed efforts in the global fight against diseases like malaria, dengue and TB, mathematical modelling is fast becoming a tool to guide public health policy. 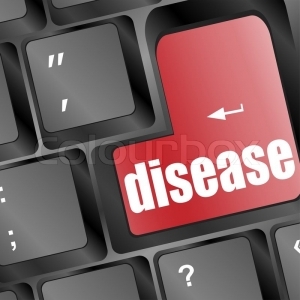 This short course will focus on the application of mathematical modelling and computer simulation to predict the dynamics of infectious diseases to evaluate the potential impact of policy in reducing morbidity and mortality. Topics covered include compartmental models, spatial models, introduction to agent based models, economic evaluation methods and more. The course is practically focused along with a series of lectures and guest seminars. This course is aimed at postgraduate students in Science and Health Sciences faculties and health-based researchers interested in the field of mathematical modelling for infectious diseases and public health policy. Note: UCT Students wishing to attend this course in lieu of a Masters Module will need to register for STA5066Z offered by the Department of Statistical Sciences. Please indicate this on the application form. The course fee covers registration and lunch only. Accommodation and other meals will be for the participant’s account. Funding: Course participants may qualify for funding through the Teaching Development Grant National Collaborative Project. Please consult the website www.up.ac.za/ntdg for the funding application form. Requirements: Attendees are required to have previous exposure to quantitative training. Basic skills in R programming (or any other language) is required. Participants are also required to bring a laptop to the course. Please return the application form to Mrs Celene Jansen-Fielies at celene.jansen-fielies@uct.ac.za by no later than 25 April 2019. Accommodation is available at the UCT campus and at establishments near UCT. Please consult the list below for accommodation options. Other options may be found online.